Thank you to Agnes & Dora Rep, Rachel Pias, for providing me with product in exchange for my review. All thoughts are my own. When I was a little girl, one of my favorite things during the weeks leading up to Christmas was going shopping with my dad for a new dress to wear on Christmas Eve. It's a tradition that lasted throughout my entire childhood, and I cherish those memories. I now have holiday shopping traditions with my dad that are a little bit different, and as I should be (I'm 34, after all), I am on my own when it comes to finding a holiday dress. I love dressing festively during the holiday season, but grimace at the thought of shelling out a bunch of money for a dress I may only wear a few times. The practical and frugal voice in my head tells me to find something that I can wear during the holidays, but also wear throughout the rest of the year. Maybe that voice is my husband's? Sometimes it's hard to tell if our thoughts are still separate. A couple of months ago, I kept noticing a friend of mine from college posting about clothes from Agnes & Dora on Facebook. I'd never really heard of them and was interested in finding out more about the company and the clothes, which looked like they would really suit my style and my budget. I was lucky enough to connect with the amazing Rachel Pias, an Independent Rep for Agnes & Dora, and owner of Blue Aura Boutique. 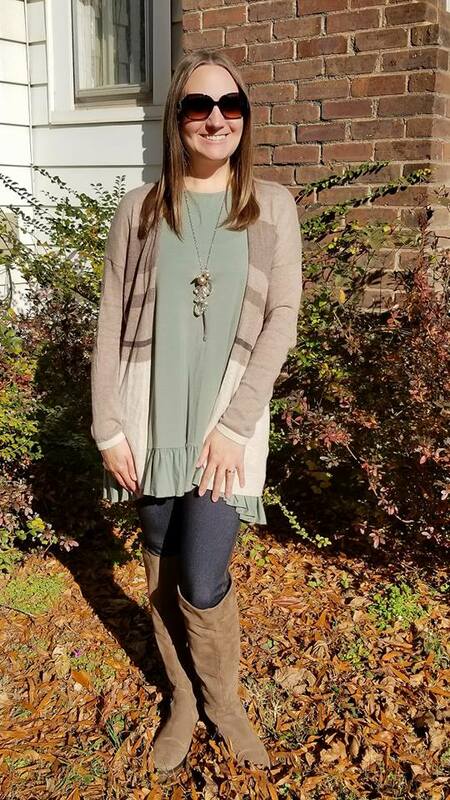 Rachel hails from sunny Florida, an incredibly busy lady with her boutique, and opening a restaurant, as well! My Agnes & Dora Mini Capsule arrived in a gorgeous box! As I removed the box lid, a card, business card, and three unique pieces by Agnes & Dora were revealed. 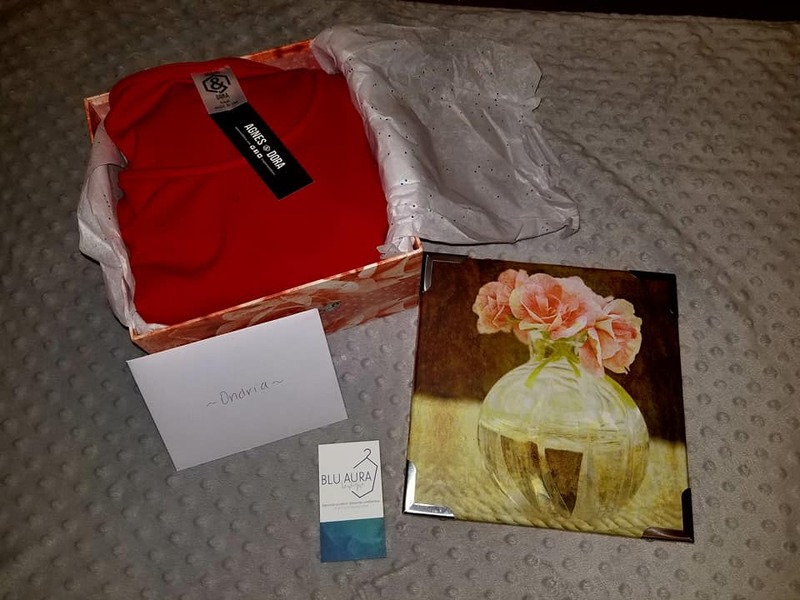 Rachel sent me a gorgeous Mini Capsule filled with Agnes & Dora apparel, and it has been one of the most beautiful packages I have received in quite some time. It was such a treat to 'unbox' and I looked forward to styling each piece included. 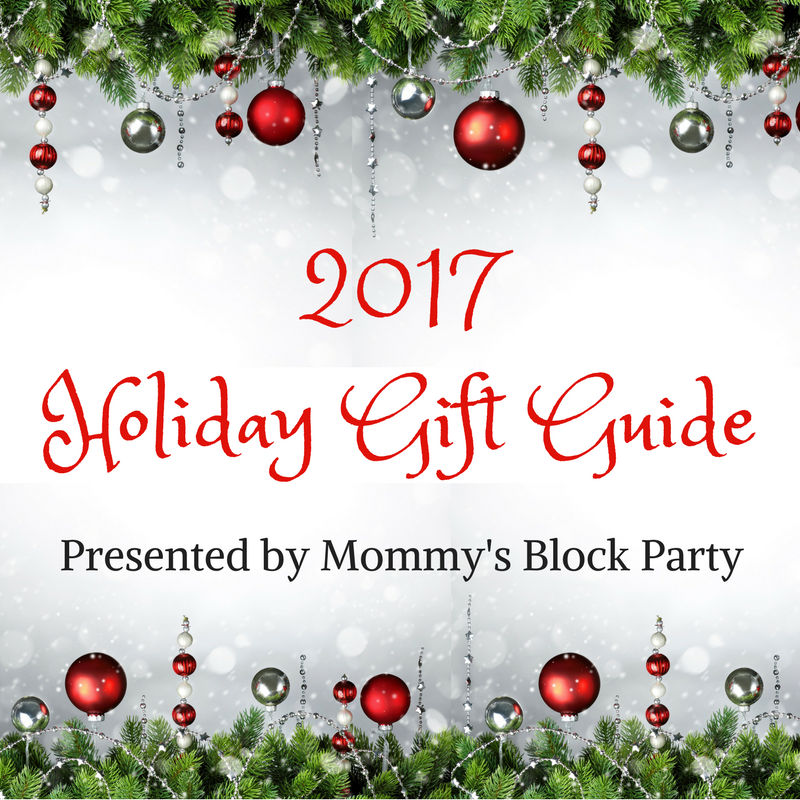 Included were three of the pieces that I had mentioned caught my eye, all perfect choices for the holidays! 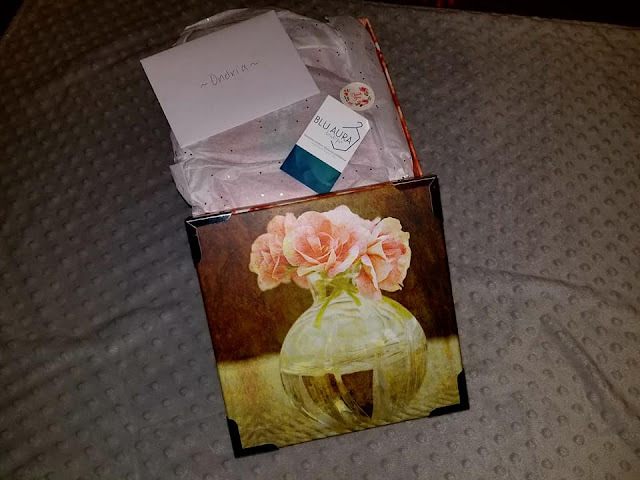 The way the items were packaged really spoke to me about how much Rachel cares about her business and her customers. She truly goes the extra mile to make sure that her customers are satisfied, and also, she enjoys giving them something special! I was so excited to style and create three holiday looks with the pieces Rachel sent to me. Every gal needs a go-to tunic, and this one is mine. I am choosy about my tunics. I don't care for them to be too binding and hug in the wrong places.The Love Tunic is worthy of love, love, love! It's gorgeously soft, rich in vibrant red, and drapes in a way that accentuates, rather than hangs from the body. I have actually already worn this gorgeous tunic a couple of times this holiday season, and plan on wearing it more, more, more! Above, I wore it with black leggings, black booties, and black and gold jewelry. I have also worn it with black damask leggings, a black open cardi, tall black boots, and black/crystal jewelry for a glam look. It looks gorgeous with leggings, or even skinny jeans! The look you create with it is totally up to you. I can tell you that this piece is beautiful and so comfortable! I love wearing it. I don't usually say that about many red pieces, but truly, I do love this one! Fits true to size, and I am wearing an XS. Falling in love has never been so effortless. Inspired by the popular Love Top, this Tunic is the fresh, new version of an Agnes & Dora classic. 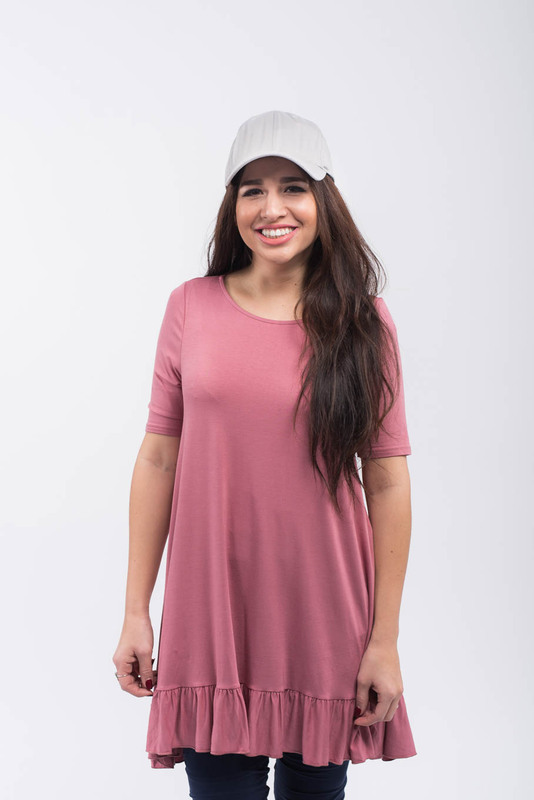 The Fisher Dress is perfect for a casual night with friends or a glam night out! I am in deep love with the Fisher Dress. It's so perfect for all year long! It's a great choice for summer and fall, because it can be styled to look very casual. 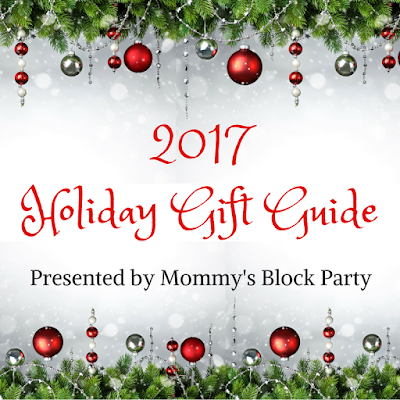 I chose to glam it up for a holiday look with leggings and booties, and statement jewelry. This is the dress you want to have in your closet so that you can quickly find it and style it for holiday parties, special events, cocktail events, etc. I'm wearing this little pretty on Christmas Eve, and plan to wear it for New Year's parties, as well. 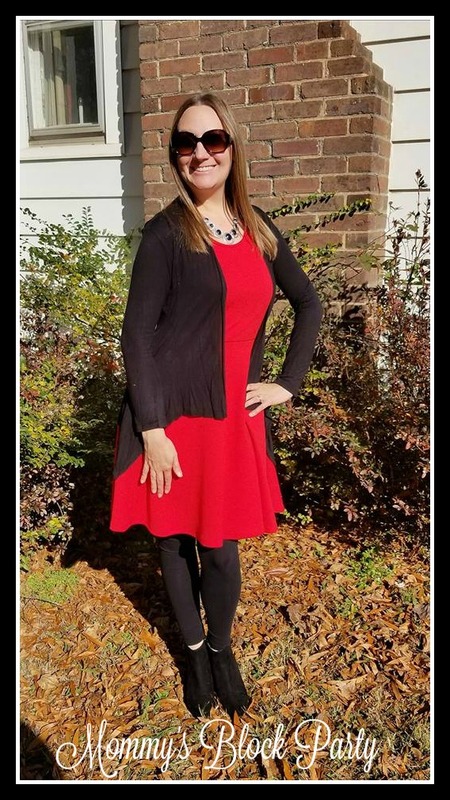 It pairs beautifully with tights or leggings this time of year, and looks great with flats, booties, a cute peep toe slingback, or tall boots. Pair with a cardi and some glam jewels, and you're all set to look fabulous wherever you're headed. 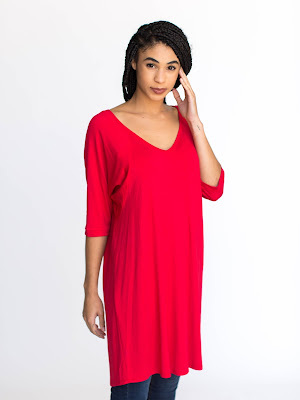 The Fisher Dress is available in various colors. If red isn't for you, go with black- you won't be sorry! I am wearing this dress is a size small, and it fits beautifully. This sleeveless stunner is perfect all year round. Tan your shoulder and stay cool during the day, and add a cardi at night when things cool off — for one fun, flirty outfit. 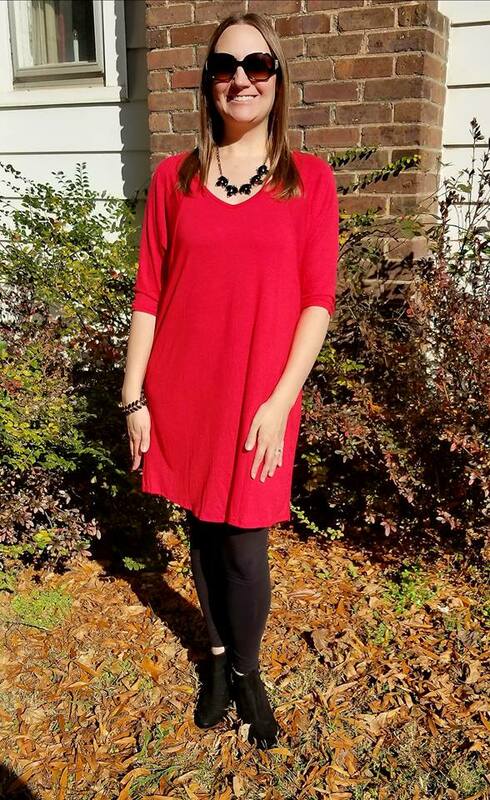 The Ruffle Tunic is an easy style to wear through the week! One of my favorite pieces is the Ruffle Tunic. I had a lot of fun playing with this one, and deciding just how I wanted to wear it. The nice thing about this and all other Agnes & Dora pieces, is that they are so versatile... you can really wear them any way you want to! The Ruffle Tunic that I have on is in a beautiful sage green color- one of my favorite colors. I wanted to pair it with some light neutrals, so I just grabbed a sweater, a pair of skinny jeans, and tall boots from my closet. Being able to mix and match staple pieces with items I already own is a huge deal for me. This beautiful tunic is short sleeved and can be worn all year long. It has a lovely ruffle detail at the bottom, giving it an extra dose of femininity and grace. I love these Agnes & Dora pieces so much! They're really adding a sparkle to my holiday wardrobe and giving me lots of fun options to enjoy all year long. As I look through Rachel's Party All the Time Agnes & Dora site, I want everything I see. I am just dreaming up more and more ways to style those pieces. I also see pieces that would make gorgeous holiday gifts! All of the ladies in my family would love to be decked out in Agnes & Dora for the holidays & beyond. Once you get started with a few Agnes & Dora pieces, it's hard not to become addicted and want them all! Luckily, their prices are awesome, and Rachel makes shopping super fun! There are two ways to get your shop on and take home some gorgeous Agnes & Dora styles... shop Rachel's Party All the Time Agnes & Dora website for the latest looks. The items that Rachel currently has available will be displayed on her website. Size charts are available to view, as well. You can also shop with Rachel through her Blue Aura page on Facebook. I've hopped over there several times just to enjoy live shopping with Rachel. Rachel pops up via video and literally shows you what's new, shows ways to wear Agnes & Dora pieces, and posts fun surprises and deals! It's so much fun to shop with Rachel this way. Rachel is so sweet and she's available to answer any questions you may have about Agnes & Dora! One lucky reader will win a $50.00 gift code to shop with Agnes & Dora Rep Rachel Pias! Use the RC entry form below to enter to win. Giveaway is open to US residents, 18+, no PO Boxes. This giveaway is in no way affiliated with Facebook, Twitter, or any other social media platform. Void where prohibited. MBP is not responsible for prize fulfillment. Please see our policies page for details. 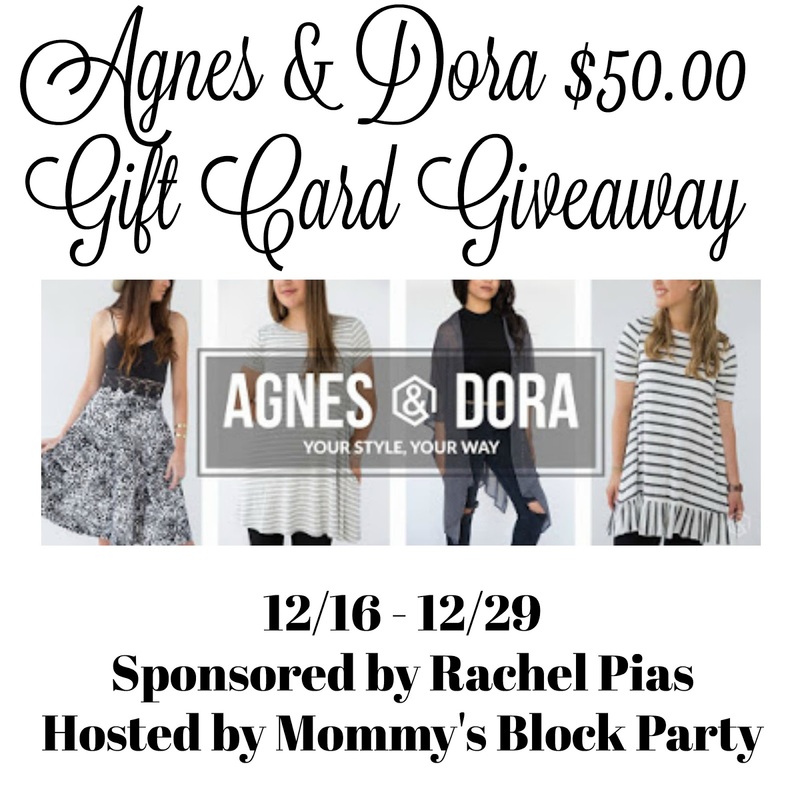 Special thanks to Rachel Pias for allowing me to share about her gorgeous boutique & introduce Agnes & Dora to our readers this holiday season. Look for these looks in our 2017 Holiday Gift Guide! Which Agnes & Dora pieces would you love to style and wear this season? it all looks great but I especially love that red dress on you! Thank you, Sarah! It's definitely a favorite of mine! Be sure to enter the giveaway we just added for a $50.00 gift card to shop with Rachel! Me, too- hard to choose favorites when it's all so beautiful! They have gorgeous tops- so versatile for everyday or for dressing up. I'd get the Marsala Swing Tunic. I also like the Taupe Slub Pullover and the Red Holiday Dress. I like the tassels denim cover up top. So cute. I really like the black dress!!! I love the Side Slit Maxi Skirt Hula Dancer, so pretty! I like the pullover tunic floral. The ruffle tunic is cute too. I love the Ruffle top... or the oakley dress! Maybe the pullover tunic I'd have to look around more. I like an oversized top and usually not a pullover unless it has a larger neck opening. I would love to get a new tunic or dress! I would buy tops! The red on is beautiful! I would invest in a new dress! Just gotta decide on which one! 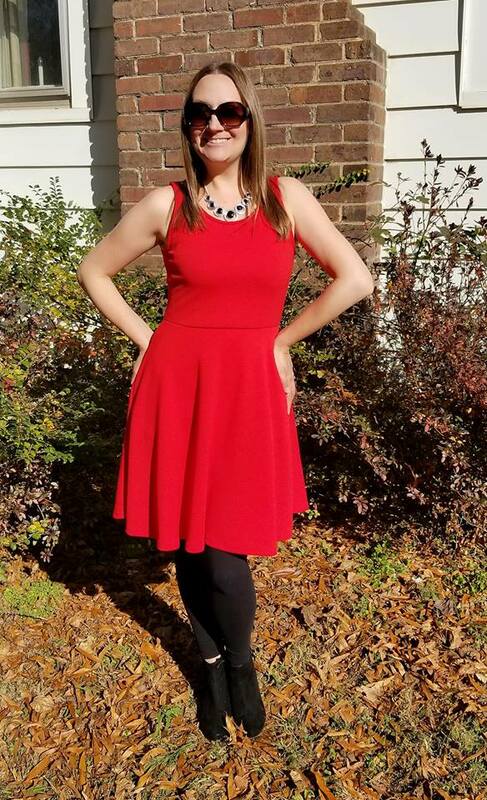 Red Holiday Dress is super cute! I would get a couple pair of leggings! The ruffle tunic with some nice leggings and boots. I'd get the black dress!